This page intends to present one mountain with multiple tops, in the Czech Beskides. For many reasons, I thought one page was widely enough instead of repeating most of the content : The most famous top (Radhošť) is not the highest (Kněhyně), and the mountain owns a couple more, not very distant from each other. And most hikers tend to visit all at once. Since the neighbouring Lysá Hora, queen of the area, is kind of defigurated (radio transmitter on top, road, many buildings), many locals believe this massif is the most beautiful of this area. Culturally speaking, there is a lot to say about it as well, for many reasons that were already described in the Beskidy page. * Radhošť, 1129m, is the southernmost top. There is a small transmitter, a wooden chapel from 1898, a statue of Cyril and Metodĕj, a mountain hut, Horský hotel Radegast. During times of Slavic antiquity, a sacred ceremony, which rejoiced the god of Radegast, took place here. Pilgrimages take place to the chapel. A bit earlier on the trail leading to it stand a statue of the local pagan god Radegast. Radhošť is also a popular mountainbiking goal, with a suitable trail (page on MBPost). * Pustevny is a group of huts and a ski resort located at the eponym pass, around 1020m of height. A road open to cars (but paying car park) serves it. Some accomodations like Chata Šumná are available there. But the most interesting is certainly the group of painted huts, designed and buit by the 19th century architect Dušan Jurkovič, mixing Art Nouveau with traditional vernacular wooden architecture of the Carpathians. The result is surprising and very worth seeing. Some other of his masterpieces are to be seen in CZ. * Heading North from Pustevny is located a peaklet named Tanečnice (1084m). This "bump" can be avoided by the green trail below, east. * Čertův Mlýn is the next peaklet located in the continuity (1205m). It is a natural reserve. 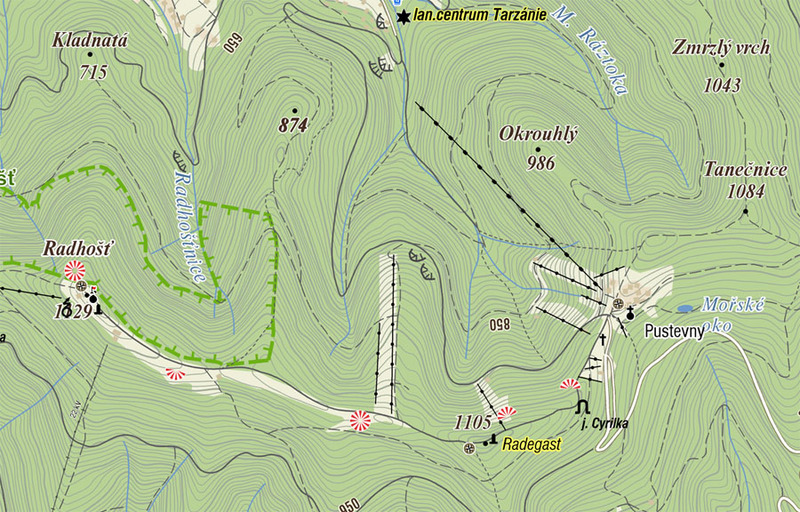 * The northernmost and culminating point is Kněhyně (1257m), after a sharp turn left on Čertův Mlýn. Kněhyně, contrary to the two previous ones, owns a couple of clearings on the top, unveiling some fine views. The whole mountain, mostly made of sandstone, is pleinty of underground passages and caves. The most famous is Volárka, approximately 200 meters eastward from Radhošť. Another one is located on Kněhyně. And don't forget to give the village of Štramberk a visit if you're around ! - From Prague, take the direction to Oloumouc and then Nový Jičín. For all three options, you must then reach Rožnov pod Radhoštěm, and then Postredni Becva to catch the road leading to Pustveny. Another trailhead is Trojanovice, on the north side of the mountain, best reached from Kunčice pod Ondřejníkem. On the natural reserves like Čertův Mlýn, do not camp, do not make fires, etc etc. * Wild-Camping : out of the protected areas (Čertův Mlýn), it is in theory possible (or tolerated ?) but remember that this region hosts predators of all sorts. * Official campsites & accomodations: many in the valleys, especially around the town of Frenštát pod Radhoštěm.